Sales Gossip is a free to use interactive platform designed for fashion lovers, allowing them to find great bargains of up to 75% off on a daily basis. 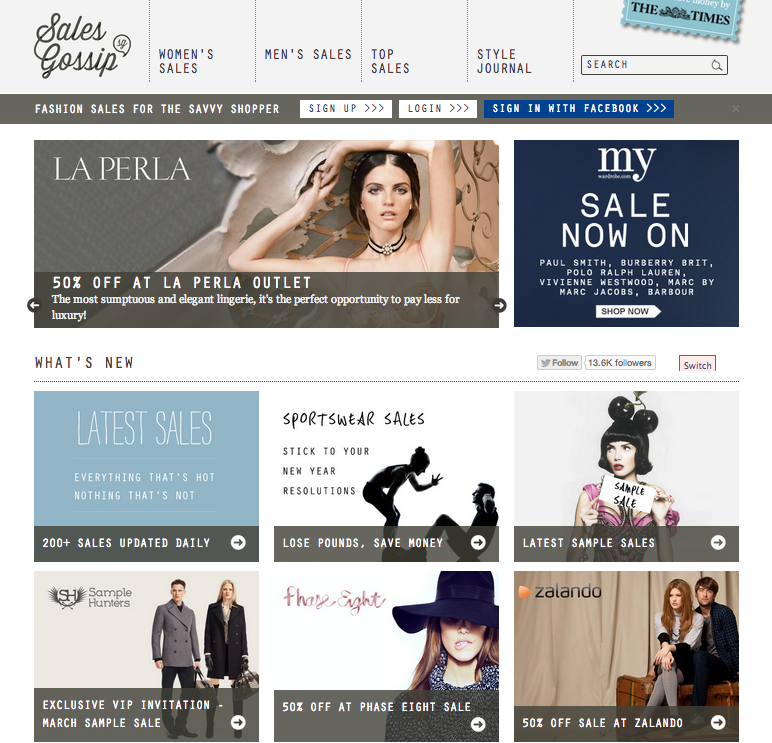 Sales Gossip collects information about pop-up sales, flash sales, sample sales, discounts and seasonal reductions from over 700 high street and online retailers. Shoppers can then search and discover the sales according to their location, the brands they love or the outfits they are hunting for. You better sign up though, as you won’t be able to browse otherwise! Sign in with Facebook account to make the process even quicker! Don’t forget to leave feedback if there’s anything you want to say, it’s quick and easy! Always check for current competitions you can enter, there’s often a lot up for grabs! Sales Gossip brings all the information you want to know right to your doorstep (or inbox, rather). Once signed up, you can stay clued up on all the best discount, offers and sales from online and on the high street. Best of all, you can cater all the information you receive so it’s only what you want to hear. Well, what are you waiting for?